Tampa Bay Buccaneers quarterback Jameis Winston is in the process of settling a lawsuit filed by a female Uber driver in Arizona who accused him of sexual assault. 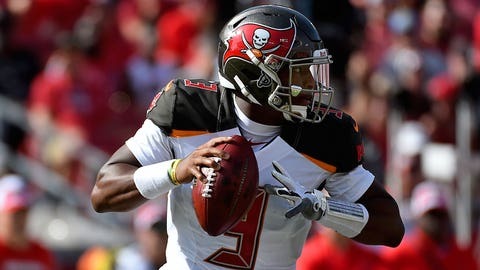 PHOENIX (AP) — Tampa Bay Buccaneers quarterback Jameis Winston is in the process of settling a lawsuit filed by a female Uber driver in Arizona who accused him of sexual assault. Documents filed Monday in U.S. District Court in Phoenix state that a settlement agreement should be finalized in 10 days. Details weren’t disclosed. The woman sued Winston in September and had been seeking $75,000 in damages. She alleged Winston grabbed her crotch while they were waiting in the drive-thru of a Mexican restaurant in Scottsdale in March 2016. Winston, the 2013 Heisman Trophy winner while at Florida State, was in Arizona for a charity event at the time. After an eight-month investigation into the incident, the NFL in June suspended Winston for three games for violating the league’s personal-conduct policy.